1. Elevated Rides Puts You in a Better Mood : When you ride one of those rides that take you to high altitudes then drop quickly, endorphins are pumped in your body. This boosts your energy and improves your mood. 2. Scary Rides Help You Burn Calories : Scary rides like the roller coaster don’t only make you scream till you’re out of breath, but they also help you burn from 40 to 70 calories while riding them. 3. You Walk a Lot without Realizing : Many theme parks cover a vast area which makes you walk miles while moving from one ride to another. You can burn up to 1000 calories if you walk up to 10 miles around a theme park, and you won’t even feel it because you are having fun. 4. 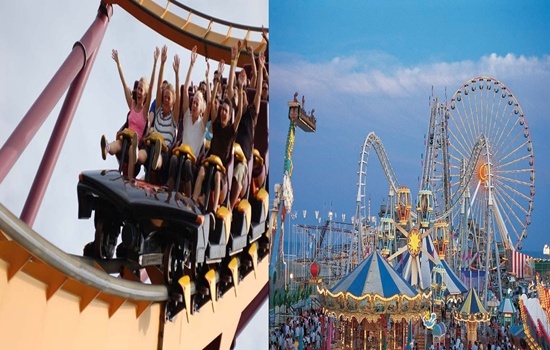 Thrill Rides Help You Conquer Your Fears : When you see other people finding excitement in thrill rides, you become more encouraged to try them out and conquer your fears. Overcoming your fears in one area improves your confidence to face other fears in life. 5. Crazy Rides Tone Your Muscles : The quick movements of crazy rides make your muscles react to their tosses and turns by tightening up. The muscles you target at the gym can actually benefit from these rides. 6. Screaming Helps Your Relief Stress : Although you scream of fear in thrill rides, these screams help in reducing your stress and anxiety because the brain categorizes ride movements as safe motion.